Awhile back Amoeba and I went to Seattle and spent the day just playing. This was a snap from our stroll down along the water front. Fantastic! It’s hard to tell where reality ends and reflections begin!!! Love it! Clytie — thanks. These are my favorite kind of water reflections. What a terrific reflection shot, Quilly! I always love reflections on the water and the waterfront is always a great place to roam around! Hope you’re enjoying a great weekend so far! Sylvia — I am having a restful weekend. I think I over taxed myself on my last vacation. All I want to do is sleep! You can´t tell where the posts start or end… Looks great! Betty — that’s what caught my attention. The reflection is almost perfect where pole meets water. Oh I know exactly where that is! Wonderful! Cieldequimper — Amoeba works for UW at Friday Harbor, but had a meeting on the main campus, so we made a day of it and enjoyed the waterfront. Polona — that’s why I risked life and limb (and camera) leaning over the railing to get that shot. The more I see, the more I realize that trip to the upper Northwest is definitely going to be necessary in my life! Melli — and I still have some great shots I’ve not yet shared. I love how the posts seem to melt at the bottom–lovely weekend reflection! Beth — thanks. That’s what lead me to snap the photo. Real nice reflection ! Did you check your door ? there might be flowers and Arthur ran away, lol ! Gattina — no flowers. That Arthur. He probably ate them! Stay tuned. If I can find the energy to care, I will post more. I seem to be exhausted from my bones. Take your time. I know all about exhaustion. As for the figure skating shot, I have a good camera and I have good seats often at events… I’ve got thousands and thousands of figure skating photos I have taken haha, I really need to organize them on my computer better sometime though because they are all mixed up right now. I have met the skaters and been backstage (at Worlds, not shows) but not for long and that was before I had my good camera. Amazing picture! Love the water and the reflection of the posts! I do love Seattle and this is such a serene and beautiful shot. I’m so glad you’re enjoying it up there. I know just where that is. Great spot for watching sunsets. 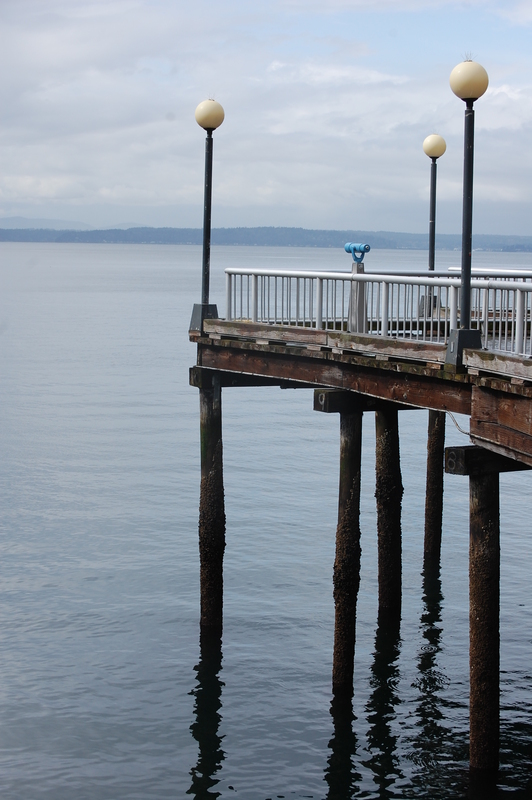 I do so love the Seattle waterfront.